Originally native to Ontario, the Trumpeter swan's extirpation from eastern Canada over 200 years ago was primarily due to hunting pressure and habitat loss. Biologist Harry Lumsden began a provincial reintroduction program in the early 1980's to re-establish the Trumpeter swan in its former habitat and range. With prime wetland habitat, and archaeological evidence confirming the historical presence of Trumpeters in the Wye Valley, Wye Marsh Nature Centre became a co-operator in the restoration of this magnificent species in 1989. The original captive breeding pair of Trumpeters at Wye Marsh were "Big Guy" and "Lady Girl", who successfully raised the first cygnet in 1990, "Pig Pen". In 1993, Pig Pen and her mate became the first wild nesting pair of Trumpeters in Wye Marsh in over 200 years. When is the best time to view Trumpeter Swans at Wye Marsh? Trumpeter swans can be found at Wye Marsh all year long, with one of the most exciting times to view being in the winter months. In the summer most swans are together in pairs building a nest and hatching cygnets. Swans that are not at breeding age are feeding and enjoying the 'single life'. Once the fall rolls around the swans are teaching their cygnets to fly and 'single' swans are stocking up on resources for their migration. Needless to say the summer and fall are not optimal times to see swans at Wye Marsh as the families are out in the more protected areas of the marsh raising their cygnets. In the winter single swans that are ready to mate pair up with perspective partners and existing families show off their bonds by head bobbing and honking together. All around, winter is a social time for swans and as a result Wye Marsh can have up to 60 swans enjoying their social afternoon at the swan treatment centre. We keep an area of water open for the swans and supplement their diet with and corn and duck pellets, which essentially provides them the human equivalent of a rest stop on the highway, allowing them to stop in and fuel up, socialize and then carry on with their migration. Spring is when the pairs head off to start the cycle all over again and the 'new kids' on the block spend some time alone or in small groups discussing the woes/benefits of the 'single' life. Check out our YouTube video of the swans greeting our Swan Monitoring volunteers and showing off their family bonds. There are a number of ways for wildlife enthusiasts and interested members of surrounding communities to continue their involvement in the Wye Marsh Trumpeter Swan Program. To continue thorough monitoring, we encourage the public to continue to send in their reports of Trumpeter swans sightings. 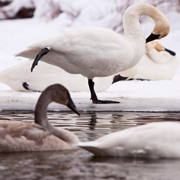 Sightings include all Trumpeter swans, tagged and/or banded, untagged, adult and cygnets, and should include as much information as possible, such as location, total number of individuals, general comments about behaviour, appearance and health, etc. Another great way to become involved is by joining our team of dedicated volunteers! 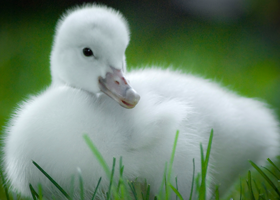 By becoming a Wye Marsh volunteer in the Swan Program, you will be trained by qualified staff to feed and monitor wild Trumpeters, monitor and care for our permanent resident swans, and join our animal care team dedicated to the care and recovery of sick and injured Trumpeter Swans. The Wye Marsh Nature Centre relies on financial contributions from individuals and organizations to be able to continue this important work. The Wye Marsh Nature Centre urges the surrounding community to be proud of its involvement in the trumpeter swan program. We are honoured to be a part of efforts that have successfully restored an incredible species. This exciting milestone would not have been possible without the help and dedication of the many volunteers and supporters of this program.